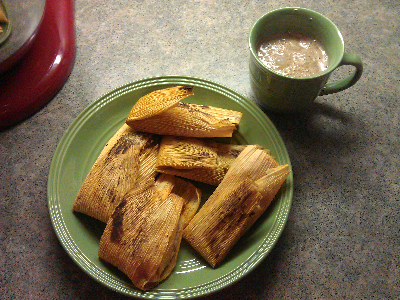 On Christmas day I was lucky enough to have some of my mom's leftover tamales. To serve along with this I had leftover champurrado that I brought to the dinner. There is nothing more perfect than this combination on a cold winter morning. The texture of the mass with the spicy pork filling went well with the rich cinnamon and chocolate notes of the champurrado.